Price is per CPU. This is a used processor, but works without issue. This sale is only for the CPU, no other components are included. Core i7 2nd Gen. Sandy Bridge. Core i7-2600K. Graphics Base Frequency. Trending at $99.72eBay determines this price through a machine learned model of the product's sale prices within the last 90 days. Intel i7 2600k cpu with Alpine 11 GT Rev 2 heatsink fan. Condition is Used. Shipped with USPS First Class Package. Intel Core i7-2600K 3.40GHz LGA1155 Processor. Condition is Used. Working order and with original packaging. Shipped with USPS First Class Package. Intel Core i7-2600K 3.4GHz Quad-Core (BX80623I72600K) Processor. Condition is Used. Intel Core i7-2600K CM8062300833908 3.40GHz LGA1155 Processor. Condition is Used. Shipped with USPS Parcel Select Ground. ALL SPECS TO KNOW ABOUT THIS PROCESSOR Used, pulled from a working computer and tested to work. Intel Core i7-2600K 3.4GHz Quad-Core (BX80623I72600K) Processor LGA 1155. Condition is Used. Works great, was on a custom water cooled loop and kept frosty. Intel Core i7-2600K Processor: 3.40GHz - LGA1155 - Used/clean Pull - SR00B. Condition is Used. Shipped with USPS First Class Package. Trending at $100.00eBay determines this price through a machine learned model of the product's sale prices within the last 90 days. Intel Core i7-2600K 3.4GHz Quad-Core (BX80623I72600K) Processor. Condition is Used. Shipped with USPS First Class Package. Cpu is in brand new condition I am the first and only owner just upgraded my whole computer so I won’t be needing it anymore still a great processor in today’s standards and you can build a great gaming rig with it. Intel Core i7-2600K 3.4GHz Quad-Core L3 8M Processor LGA1155 H2 CPU /GPU 95W. Condition is Used. Intel Core i7-2600K 3.4GHz | 4Cores | LGA1155 | CPU Processor SR00C. Condition is Used. Shipped with USPS First Class Package. Processor was pulled from a perfectly working PC. 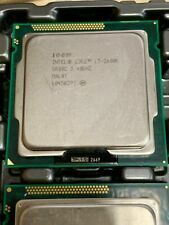 Intel Core i7-2600K Processor: 3.40GHz - LGA1155 - Used in great condition. Condition is Used. Shipped with USPS Priority Mail Small Flat Rate Box. Cpu is in excellent working condition. Photo depicts actual item. Condition is Used. Testedin excellent condition. Trending at $94.00eBay determines this price through a machine learned model of the product's sale prices within the last 90 days. This is a matched set of hardware that is known to be working together without any issues. Item Location – Paterson, New Jersey, 07524. INTERNATIONAL OR. ALASKA/HAWAII/PUERTO RICO OR. • MPN: SR00C. • Socket Type: Socket 1155 (LGA 1155). Core i7 2nd Gen. 3.4GHz (3.8GHz Turbo Boost). CPU Socket Type. Graphics Base Frequency. Core i7-2600K. Integrated Graphics. Virtualization Technology Support. Dual Channel DDR3-1066/1333. Socket LGA 1155 CPU. Currently in use in my work gaming PC, in perfect working condition. I have included pictures and screen shots. Delidded professionally, relidded, internal thermal paste changed to thermal grizzly. Works Perfectly! Intel Core i7-2600K CM8062300833908 3.40GHz LGA1155 Processor. Condition is UNOPENED SEALED NEW. Brand Intel Processor Type Core i7 2nd Gen. MPN Does Not Apply Processor Model I7-2600K Number of Cores 4 Socket Type LGA 1155/Socket H2 Clock Speed 3.4 GHz UPC Does not apply. Intel i7 2600K CPU. Condition is Used. Anything not pictured including motherboard, desktop computer, ram, manual, heatsink, power cord and OEM box are not included. Condition: Used and in good working condition. Units shows signs of usage. Processor ONLY. The CPU can be installed on motherboards with integrated Socket LGA1155 slots. 5.00GT/s DMI 8MB L3 Mfr P/N SR00C. Processor Base Frequency 3.40 GHz. Max Turbo Frequency 3.80 GHz. Cache 8 MB SmartCache. Bus Speed 5 GT/s DMI. Computer restart: 1; motherboard, 2; RAM, 3; processor. 4; motherboard, 'your motherboard needs to upgrade the BIOS'. 2; Check that the cable is installed correctly. Can't turn on the computer BIOS can't save: This is CR2032 can't save, you can try to change it. Socket 1155 / H2 / LGA1155. Type CPU / Microprocessor. CPU part numbers. The processor has unlocked clock multiplier. Processor core. The number of CPU cores 4. Turbo frequency 3800 MHz (1 core). Core steppings. Model number: i7 2600K. 1 x i7 2600k Processor. Processor Socket: 1155. Processor Speed: 3.4GHz. The number of CPU cores: 4. We are committed to resolve all issues in a friendly and satisfactory manner. Part number Q1EB Q1HL SR00C. D2 (Q1HL, SR00C). BX80623I72600K is a boxed processor with fan and heatsink (English version). BX80623I72600K . Socket Socket 1155 / H2 / LGA1155. we specialize in computer accessories and so on.